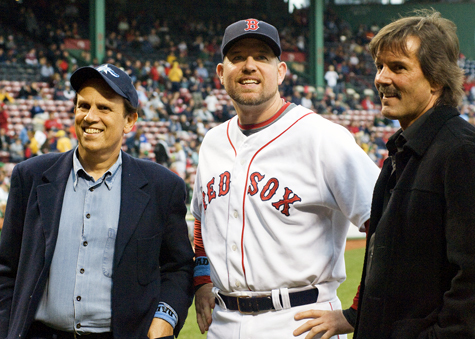 Mike is joined by Red Sox star Sean Casey and Hall of Fame pitcher Dennis Eckersley at Fenway Park before a Prostate Cancer Foundation Home Run Challenge game. Each year, fans nationwide pledge from $1 up to $10,000 for every home run in 60 select games in the weeks before Father's Day to fund innovative prostate cancer medical research. Since 1996, the Home Run Challenge has raised millions of dollars for cancer research. Learn more about the PCF Home Run Challenge.